Never Enough Nails: Lynnderella Friday Vol. 28! Happy Friday!! Any good plans for the weekend? I am anxiously awaiting this snow storm that we may or may not be getting here in CT. I hope we do get a good amount, we really haven't had any snow yet! Today I have two new Lynnderellas for your viewing enjoyment.The first is Lynnderella The Romance of the Forest (apparently named after a very old gothic novel). 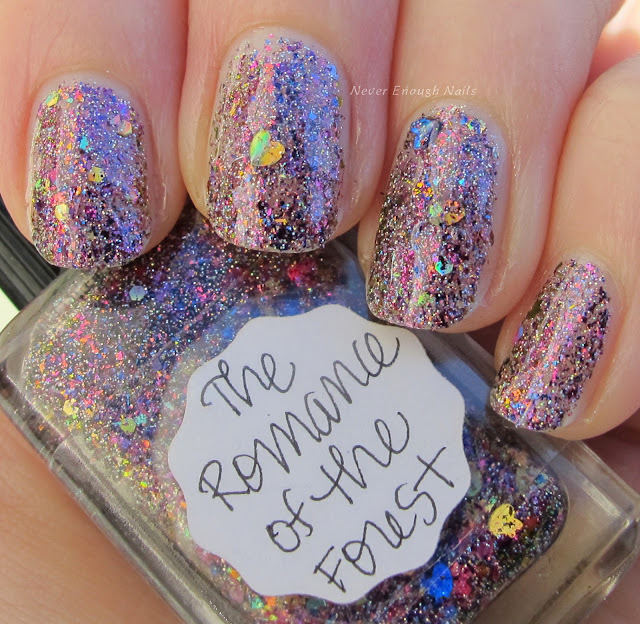 The Romance of the Forest has these gorgeous purple to green/gold flakies, with mini hearts and other holo glitters in a clear base. The color of the flakes really looks different depending on lighting and how you move your hands. 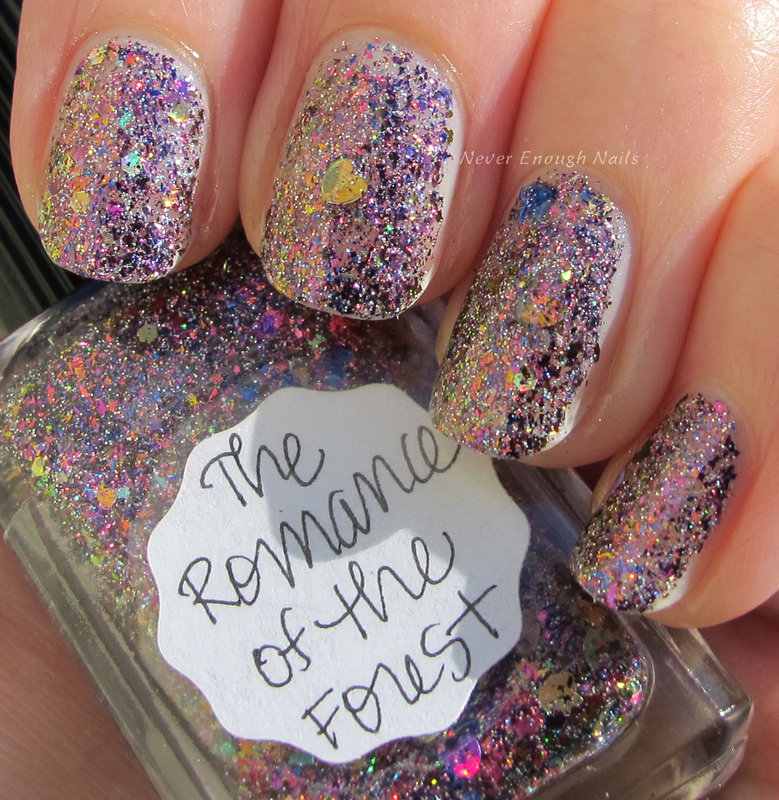 I love polishes like that- I like to just move my hands around and stare at them! Below you can see the green glow of the flakes. 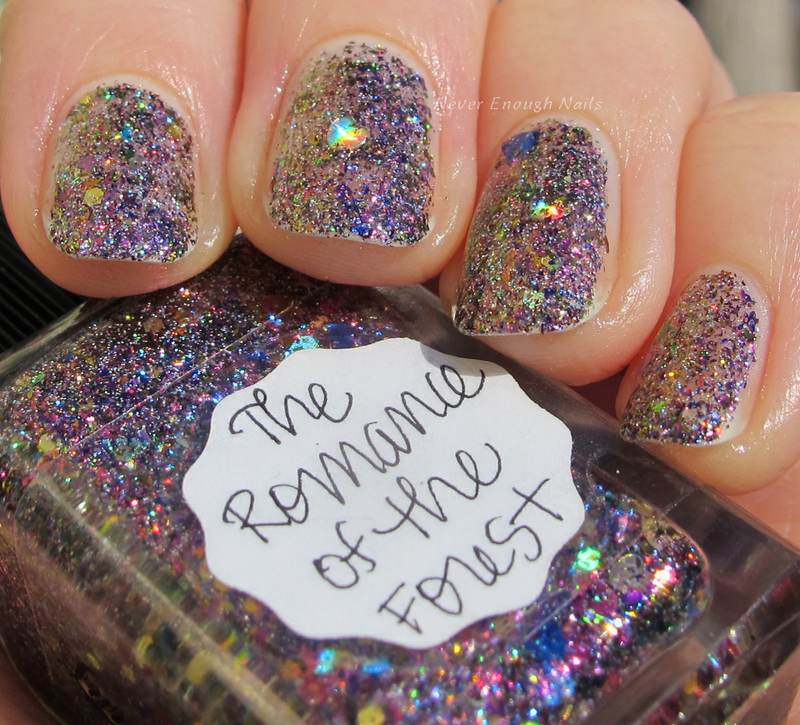 This is three coats of The Romance of the Forest by itself and it was nicely opaque. I think it would also look fantastic layered over black or really any color! It was easy to apply and the flakies are nice and flat. Oooooof... this one!! Wowza I love this so much!! 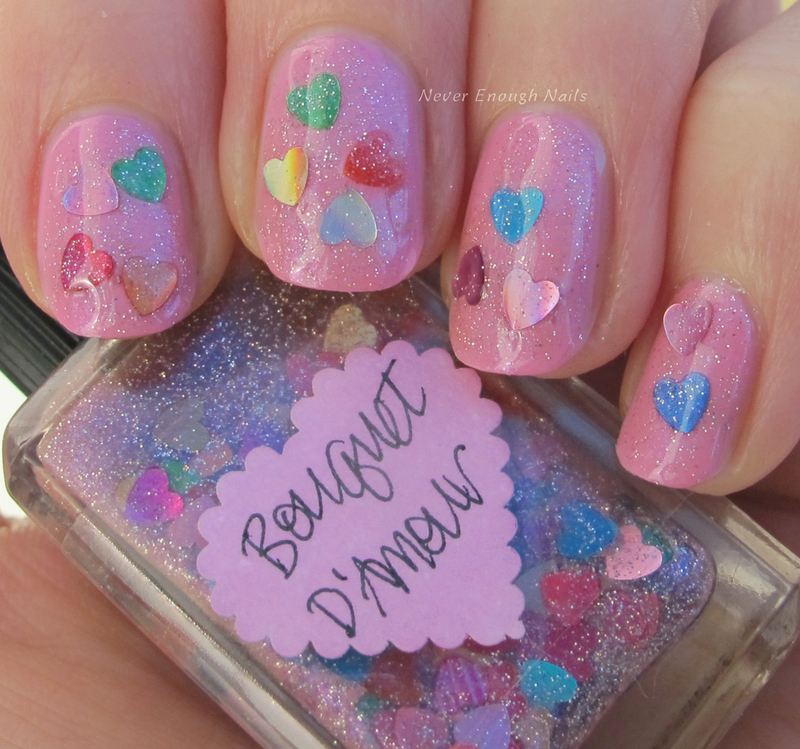 Lynnderella Bouquet D'Amour is an adorable mix of a rainbow of holographic hearts with little mini hearts and a beautiful sparkling microglitter base. 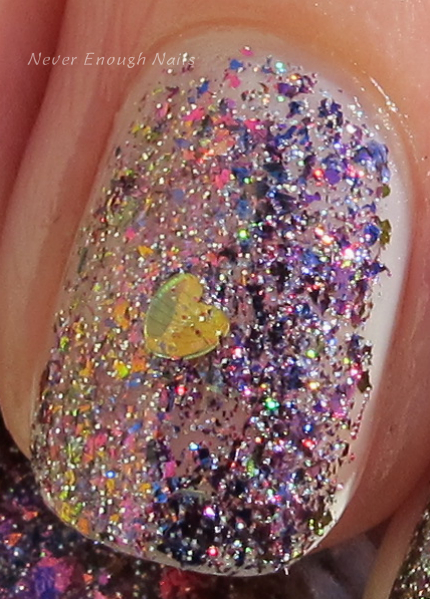 I love holo heart glitter and having all of these colors in one polish is making me leap for joy!! I LOVE that this has a clear shimmery base, because that means I can wear this over any color my little heart-loving self desires!! I want to try it over a really pale blue next. 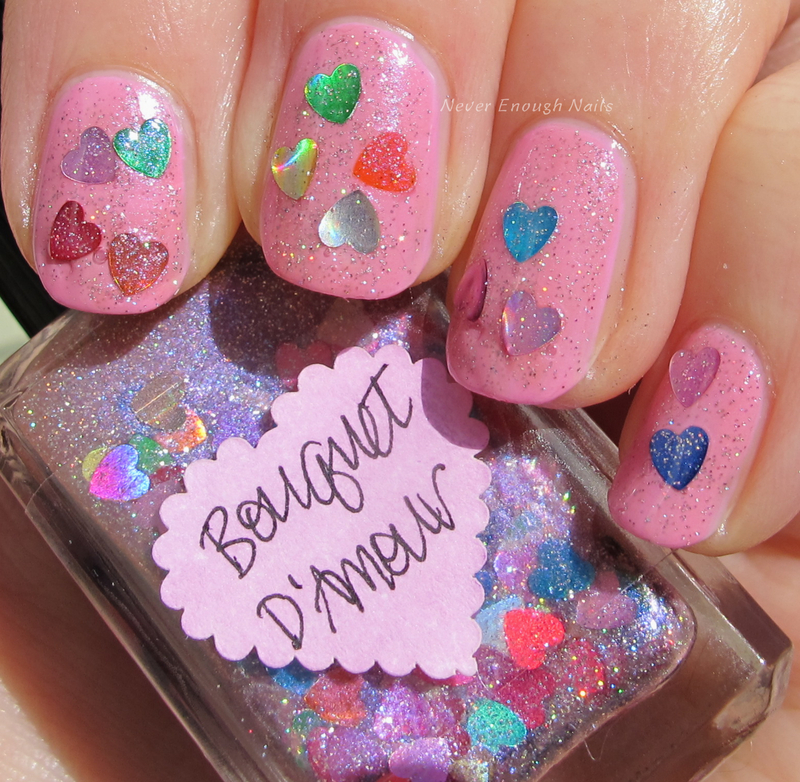 This is basically one dabbed coat of Bouquet D'Amour over OPI Look at My Bow! (Yes, the OPI Hello Kitty polishes have landed! Swatches coming Sunday!). I did go back and add in an extra heart or two wherever I felt one was needed, but they are very plentiful, so it's easy to get them on the brush. Both of these are available on lynnderella.com right now! The auction for Bouquet ends tonight and Romance ends tomorrow, but they will be available again, so keep checking back!